From as far back as I can remember, I've been a music lover. Listening to the radio, playing a musical instrument and even singing karaoke from time to time, have always given me plenty of enjoyment, so it's only natural that I want my daughter to share in my love for music. So far, Riley is right on course and loves to sing and dance to absolutely every song she hears. I've been a fan of CP Toys by Constructive Playthings for quite a while now because I love the wide variety of educational toys for kids that they offer. Recently though, I came upon the most perfect toy for Riley which definitely inspires young children to pursue a more musical path. 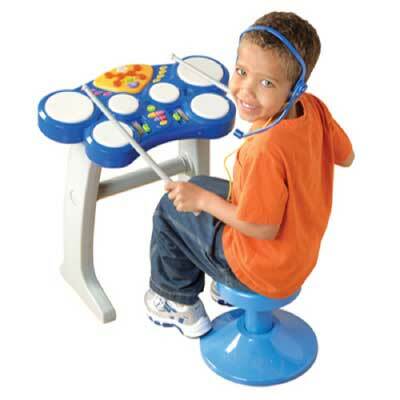 It's the Activity Drum Center from CP Toys! Keep reading to learn more about it and enter below for your chance to win one! 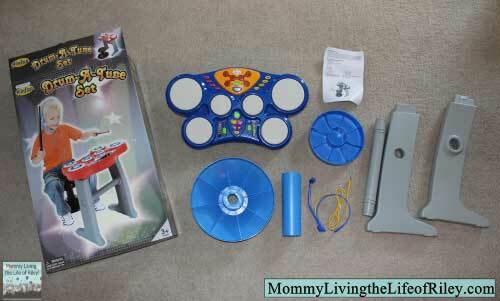 I reviewed the Activity Drum Center from CP Toys by Constructive Playthings, which retails for $49.99. Preschool percussionists will have measures of play with this activity drum. Besides the follow-the-light play mode, it has 8 rhythm selections, record, playback, tempo and volume control, plus a microphone headset for sing-along fun. The Activity Drum Center includes a stool and drumsticks, which snap under the unit for convenient storage. It's constructed of sturdy plastic, designed for children ages 3 years old and up and measures 18 ½" L x 10" W x 21½" H.
First of all, when I saw that this toy required some assembly, I immediately grabbed my toolbox and started laying out my two different screwdrivers. Imagine my surprise then, when I discovered that all of the pieces could be snapped together quickly and easily, taking me about 5 minutes to complete! The only time I needed to use a screwdriver was to unscrew the battery panel so that I could install 4 "AA" batteries into the Activity Drum Center. 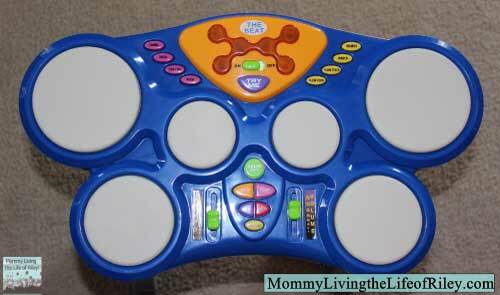 Once I turned this drum set on, I have to admit that I couldn't quit playing with it myself! It was so much fun to use and so easy to get started. There is a keypad in the center of the unit which lights up each time you hit one of the drums. There's even a feature to play a sort-of Simon Says type game where you try and mimic the pattern being lit up on the keypad by hitting the corresponding drums. The Activity Drum Center included 8 different styles of music, like rock and mambo, to try and imitate. You could make this easier or harder to do by decreasing or increasing the tempo. Special record and playback functions allow for composing and hearing each masterpiece which can be enhanced with an echo effect, rhythms, and multiple drum sound effects. What's more, your budding Phil Collins can even sing right along to the beat of their own drum with the included detachable microphone headset. I haven't given this toy to Riley yet, for I was hoping to save it for a big Easter present. There's absolutely no doubt in my mind though that the Activity Drum Center from CP Toys by Constructive Playthings is going to be one of her new favorite toys! Being able to inspire her musical creativity and hopefully begin her lifelong love of music is my favorite gift. If you have a toddler or preschooler who loves music, then I highly recommend the Activity Drum Center! Disclosure: I received the Activity Drum Center from CP Toys by Constructive Playthings in order to facilitate my review. No other compensation was received. This product review is based on my own personal experiences with this item and is completely honest and objective. I like the big keyboard fun. We would also like the junior professional drum set. I also like the big keyboard fun. My son would love the Junior Professional Drum Set. I love the big keyboard fun! The junior professional drum set would be nice. my son could drum just like daddy does. I like the guitar and bag. I love the Electronic Grand Piano! I like the Grand piano. I love their melody mix music center. Thanks for the chance. My grandson would like the guitar. My cousins would love the Dancing Challenge Mat. My kids would love the Electronic Grand Piano.